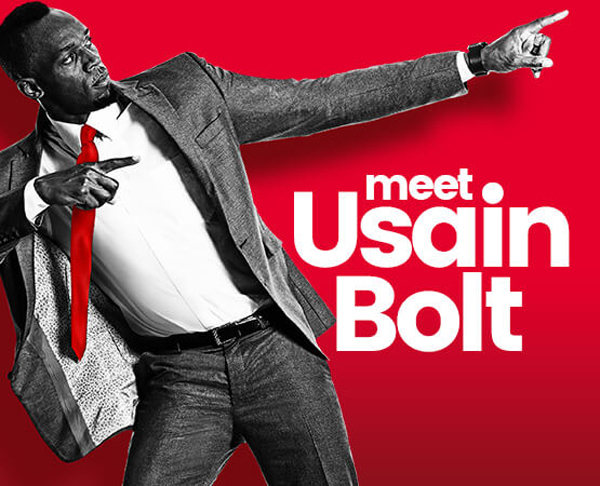 Digicel confirmed that superstar sprinter Usain Bolt — who is ‘Digicel’s Chief Speed Officer’ — will be visiting Bermuda next Tuesday [June 26] where he will appear in the Digicel store and also meet with school students at the National Stadium. “In 2004 Usain Bolt set his first world record at the CARIFTA Games in the World Junior 200m at the National Stadium and this month Digicel’s chief speed officer is coming back to where it all started for him,” the company said. “As a result Bermuda has a direct affinity with the eight-time Olympic gold medal-winner and no doubt will be looking forward to the opportunity to meet him. “Thanks to Digicel Fibre you can do just that. The islands super-fast, reliable fibre internet provider is running a competition for one lucky winner to have a personal meet-and-greet with Bolt plus win signed merchandise. See www.digicelbermuda.com for full details. Bolt will be appearing in Digicel’s store next Tuesday [June 26] where he will sign autographs and pose for photos with fans. Great to Welcome Back this Superstar! Great to have him back! Must be short on some subscribers.